Today's PC monitors give you masses more for your money than models from just 12 months ago. So does the slick new 27-inch Samsung SyncMaster T27B750, Samsung's latest Series 7 screen, have what it takes to compete in the LED panel arms race? Firstly, let's make one thing clear. The Samsung SyncMaster T27B750 is not the holy grail of PC monitors. By that we mean a high DPI screen using either IPS or VA panel technology and supporting 120Hz refresh rates. As it happens, no such monitor currently exists. So we can hardly hold Samsung to account for not delivering where the rest of the market has also come up short. However, with a full price of £400 in the UK and $550 in the US, expectations are for something special. Depending on your preferences, Samsung delivers. 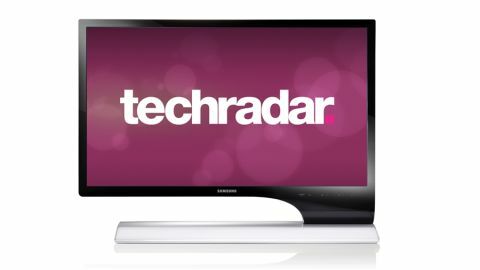 Where the Samsung SyncMaster T27B750 really nails it is as an all-round multimedia machine with a great feature set and strong AV connectivity. As a straight PC monitor, however, it's less compelling. The spec list is massive, but here are some highlights. For starters, there's an integrated DVB-T/C tuner, a pair of HDMI ports, digital audio connectivity, component video and more. Nothing terribly unusual, you say? Well, how about integrated wireless networking with Wireless Display (WiDi) support? There's an MHL (Mobile High Definition Link) port, too. The former enables you to stream video content to the Samsung SyncMaster T27B750 via a range of devices. The latter, meanwhile is something we've seen before on the T27B750's smaller sibling, the Samsung SyncMaster S24B750V. MHL is all about effortlessly connecting mobile devices to HD TVs. Currently, a number of Android handsets, including Samsung's Galaxy smartphones, some HTC handsets and a few others support MHL. Simply hook up the handset using the MHL cable and the handset's interface immediately pops up on the HD TV or monitor's screen. It's that easy. You can then use all the features of the mobile device on the larger display. In theory you could even use your smartphone as a desktop PC. Perhaps more realistically, MHL works great for playing games and video. But wait, there's more. Samsung's Smart Hub is also supported, so you can add full smart TV functionality for less than the cost of a dedicated Samsung TV such as the Samsung UE40ES7000. Plug a mass storage device into one of the USB ports and it will record digital TV, too. Nice. It's a seriously slick physical object, too, thanks to its funky asymmetric chassis, slim bezel and high quality gloss finish. The vibe is very much high-end consumer electronics rather than office or work station PC.